The Supple & Ballin Yards built wooden ships within view of downtown Portland. 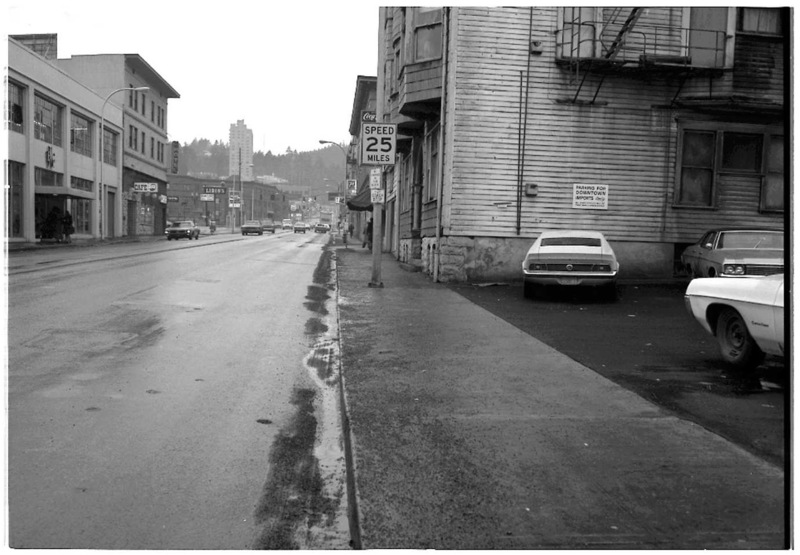 The yards were located roughly at the foot of SE Belmont Street. 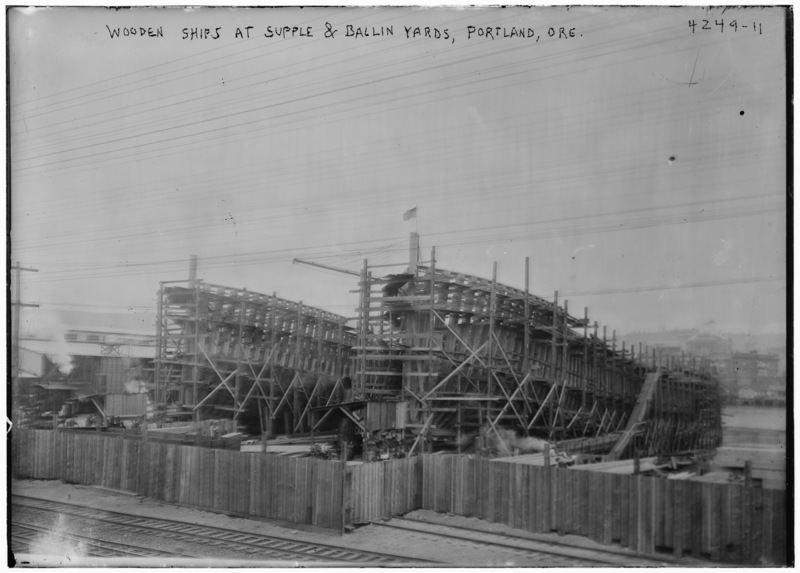 This undated photo (but probably 1910s-1920s) shows two ships under construction, a large warehouse on the left, and in the distance on the right, buildings on downtown Portland’s west side. 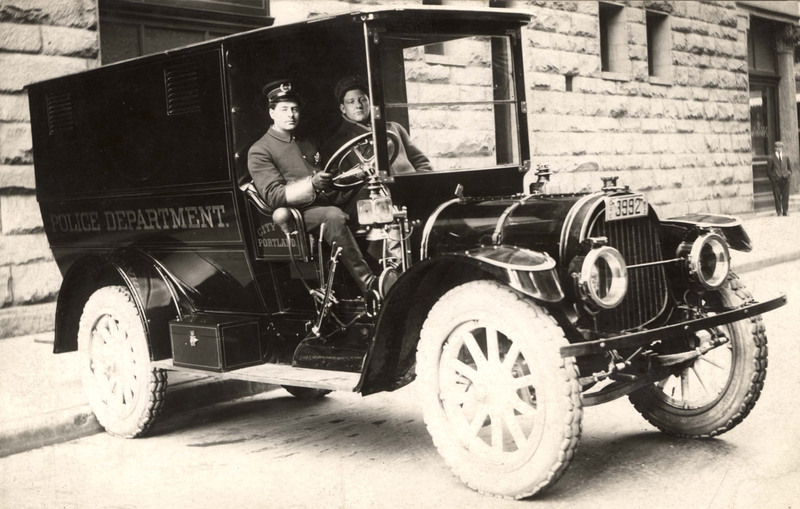 Far from the Dodge Chargers in use today, this 1912 Pope Hartford paddy wagon was the vehicle of choice for the 1912 Portland Police Department. The photo was apparently taken in front of the Portland Trust Company Building across from the police station at SW 3rd and Oak. 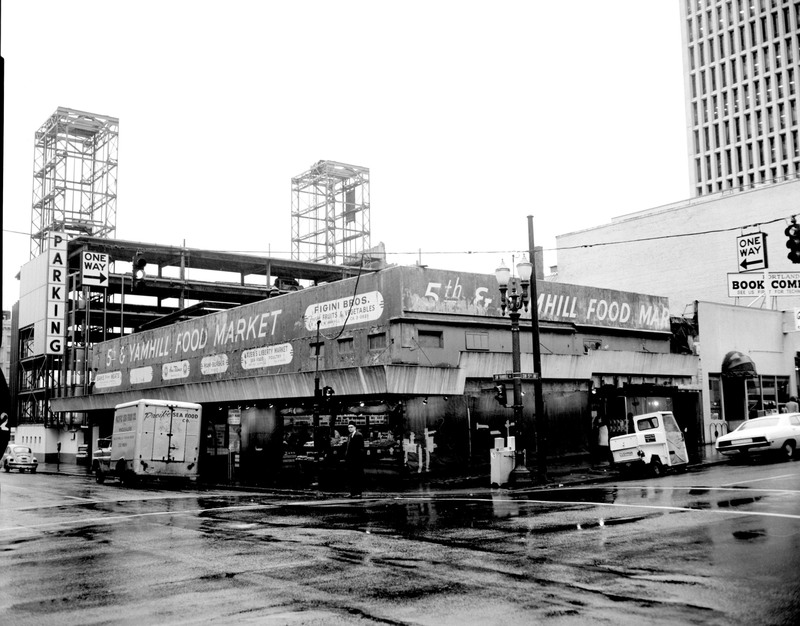 Continuing down SW 5th from our previous two posts, we cross SW Yamhill street to see the 5th & Yamhill Food Market as it looked in 1975. As with the Corbett and Goodnough buildings, this was replaced by the Pioneer Place complex. I doubt anybody misses this sad little corner. Thanks to VP fan Jim who mentioned the Goodnough Building in respect to yesterday’s Corbett Building post. The Goodnough Building was an 1891 Richardson Romanesque building that stood at SW 5th and Yamhill, shoulder to shoulder with the Corbett Building (seen at left here). Someone’s idea of a modernization at some point covered the lovely stone ground-floor arches with flat panels for signage and awnings. 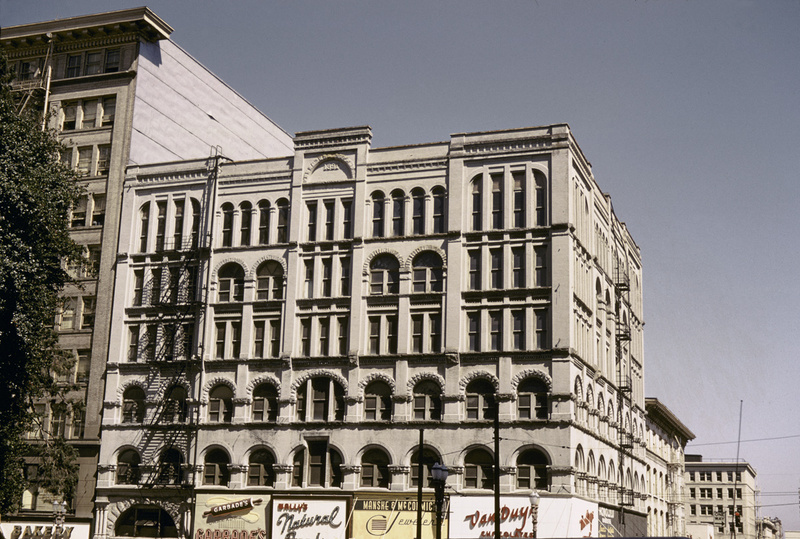 The Goodnough building was demolished sometime shortly before the Corbett in 1988. 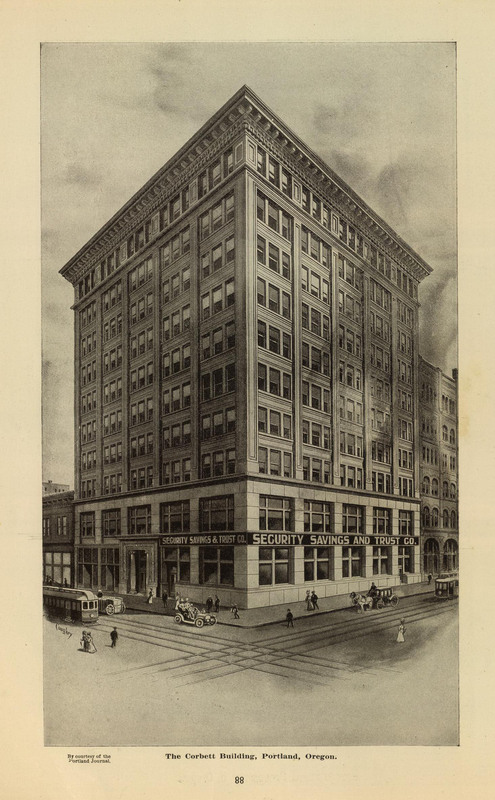 The Corbett building was probably new when this illustration was made in 1909. It stood on the southeast corner of SW 5th and Morrison and was imploded in 1988 for construction of the Pioneer Place urban mall complex. 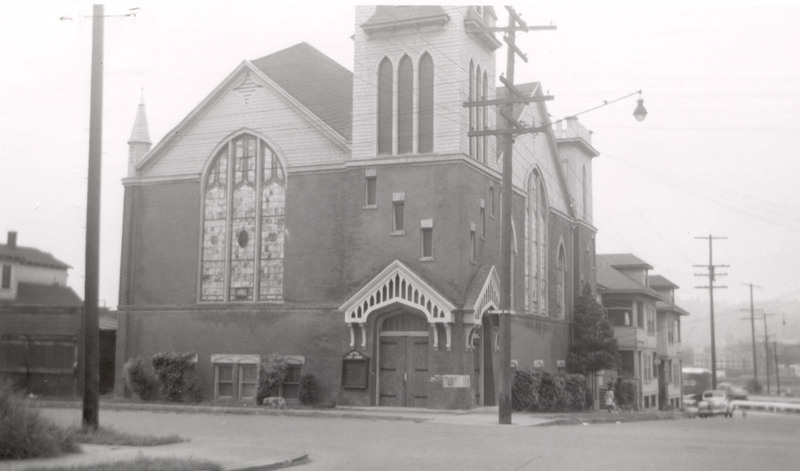 Bethel African Methodist Episcopal Church once stood on the southwest corner of N. Larrabee Avenue and N. McMillen Street. It was torn down in the late 1950s to make way for the Memorial Coliseum complex, in fact this site is almost at the center of Memorial Coliseum itself. This view looks down Larrabee toward downtown Portland.